Librarians work in an environment of constant change created by new technology, budget restraints, inflationary costs, and rising user expectations. New Directions in Reference examines how they can use new and innovative methods to design and deliver traditional reference services in a wide range of settings. The book’s contributors relate first-hand experiences in libraries large and small, public and academic, and urban and rural dealing with a variety of changes, including virtual reference, music reference, self-service interlibrary loan, e-mail reference, and copyright law. Change isn’t new to libraries but the accelerated pace of change is. Traditional lines that have existed between library departments have been erased and traditional notions about general and specialized reference services have been reconsidered. New Directions in Reference documents how librarians are re-thinking their roles and responsibilities to keep pace with the ongoing process of evolution that borders on revolution. 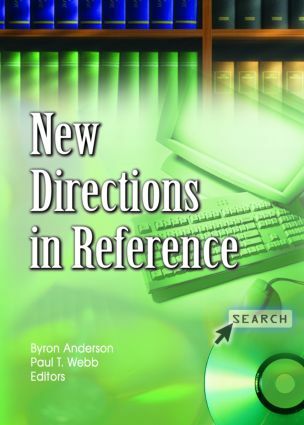 New Directions in Reference also includes case studies involving the new Martin Luther King Jr. Library in San Jose, California, and the impact of Personal Digital Assistants (PDAs) in providing references services for medical libraries. This important book is an essential professional resource for public, academic, and special librarians, especially those providing reference services.